Shocking News - Chinese Doctor Builds Nose on Man's Forehead ??? Shocking News – Chinese Doctor Builds Nose on Man’s Forehead ??? BEIJING (AP) — A surgeon in China says he has constructed an extra nose out of a man’s rib cartilage and implanted it under the skin of his forehead to prepare for a transplant in probably the first operation of its kind. I don’t have any other word in my mind because this is really shocking or strange just check out…. Surgeon Guo Zhihui at Fujian Medical University Union Hospital in China’s southeastern province of Fujian spent nine months cultivating the graft for a 22-year-old man whose nose was damaged. The striking images of the implant — with the nostril section facing diagonally upward on the left side of the man’s forehead — drew widespread publicity after they began to circulate in Chinese media this week. Guo plans to cut the nose from the forehead while leaving a section of skin still connected, and then rotate and graft it into position in a later operation. “We were just interested in helping the man and did not expect it would stir up this much attention,” Guo said in an interview Friday with The Associated Press. Surgeons previously have used cartilage to help rebuild noses in their proper position and are experimenting with growing new ones from stem cells on other parts of the body, such as a forearm. But this was the first known case of building a nose on a forehead. Alexander Seifalian, a professor of nanotechnology and regenerative medicine at University College London who has worked on transplants using stem cells, said implanting the nose graft in the forehead makes sense because the skin there has the same “structure and texture” as that of a nose. However, he said it was unclear why the Chinese team built the nose on the forehead rather than in its proper position. A nose graft grown from stem cells would be prepared on another body part first, but this operation is using existing cartilage, Seifalian said. However, Seifalian noted that he had not seen any scientific information on the Chinese operation and was just going by media reports. 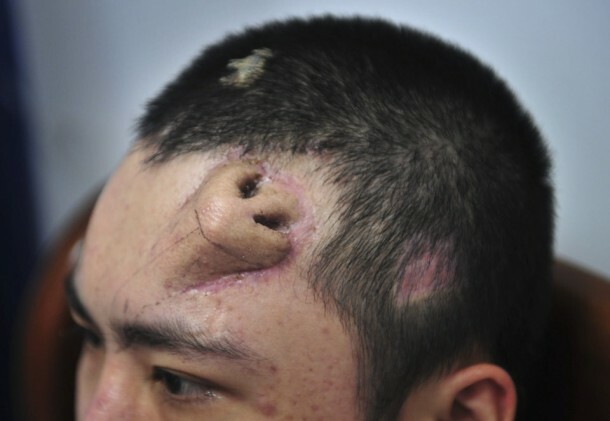 The patient lost part of his nose in an accident in August 2012 and did not immediately have any reconstruction surgery because he couldn’t afford it, Guo said. An infection later ate away much of his nose cartilage, he said. Guo said his team examined what remained of the nose and concluded there would be little chance of viably grafting cartilage there, instead building the nose on the forehead. When the new nose is rotated into position and grafted, it will at first have its own blood supply from links to the forehead, before developing new blood vessels. Later surgery will smooth out all of the skin. The team first expanded skin on the man’s forehead for more than three months before using rib cartilage to build the nose bridge. Lastly, Guo’s team built the nostrils. “We sculpted the nose three-dimensionally, like carpenters,” he said.